To accurately provide you with a price and to clearly brief our team - please complete the following website questionnaire. 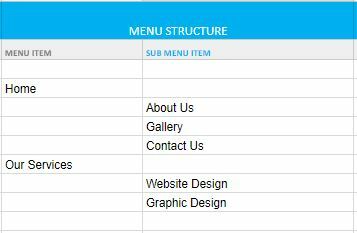 Please provide the page structure for the website including the main header pages and sub-pages, (you can attach a spreadsheet of your menu structure below). We can assist with this if you are not sure how to create this. Please provide a set of example websites to share your design ideas. Please list 3 example websites that match the style/functionality you require. Please tell us what you like/dislike about each of your examples. If you have a corporate or business Brand Guidelines document with clearly defined fonts and colours, please attach it here. Do you have special pictures/images to include in your website? You can provide these images via a shared folder – Dropbox, Google Drive or We-Transfer; please include the link here. Do you want us to collect and use images for your website design? We use images from istockphoto.com and other stock photo sites. The cost of sourced images is additional. Alternatively, you may send us images to use. Do you have any other comments/ideas we need to know about while developing your project? This includes any specific site functionality or feature that is not covered above. Please upload any supporting files here. Approximately how many products do you anticipate having on your website?